Want to Improve your Watercolors? I am sharing my painting secrets for Free! Subscribe and Get Your Guide Now! getting the results that I wanted. Creating great art is not easy without the right skills. What if there was an easy formula to create great art? Contrary to what you might think there are proven formulas for successful paintings. Step by step progression of “Show Stopper” watercolor painting published in the International Artists Magazine as a top 10 finalist in their floral competition. Step by step progression of “Sandy” the cocker spaniel in oil on a red ground. I am Krista Hasson, an artist who truly loves to share and help people succeed. I want everyone who paints or wants to paint to have a joyful experience. I want them to have the tools and the foundation that they need. I look forward to sharing my knowledge with you so your journey with art can be a rewarding one! That’s why I’m here. Every week I email out a new article on creating art. 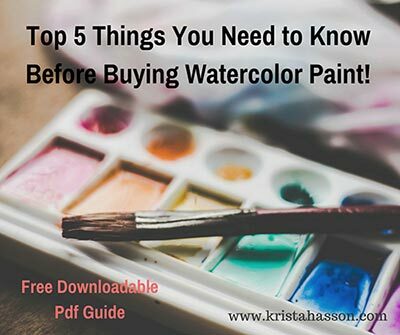 Just click the button below and you can Subscribe to get my weekly how-to articles and get instant access to my free pdf on the “5 Things You Need To Know Before Buying Watercolor” mentioned above. Want a safe and comfortable place to share, learn, and be with people who share your passion for watercolor? Join my Facebook Group “Creative Watercolor with Krista“. See you there!